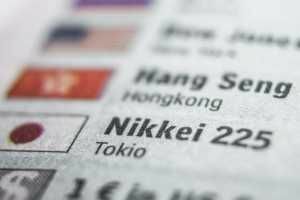 What is the Nikkei Index? The Nikkei Index, also commonly referred to as the Nikkei 225, is the most recognized Japanese stock market index. It comprises Japan’s top 225 companies that are listed on the Tokyo Stock ExchangeStock MarketThe stock market refers to public markets that exist for issuing, buying and selling stocks that trade on a stock exchange or over-the-counter. Stocks, also known as equities, represent fractional ownership in a company. The Nikkei Index considered an important measure of the Japanese stock market and the performance of the Japanese economy. Companies listed on the Nikkei Index include Sony Corporation, Canon Inc., Nissan Motor Corporation, Mazda Motor Corporation, and Panasonic Corporation. The index comprises companies from 36 different industries. As of 2013, the leading sectors were technology, consumer goods, financials, transportation and utilities, capital goods/others, and materials. Unlike other indices whose stocks are ordered by market capitalizationMarket CapitalizationMarket Capitalization (Market Cap) is the most recent market value of a company’s outstanding shares. Market Cap is equal to the current share price multiplied by the number of shares outstanding. The investing community often uses the market capitalization value to rank companies, the constituent stocks in Nikkei Index are listed by share price. Stock prices are denominated in Japanese Yen, and its components are reviewed once each year in September. The other major index that tracks the Tokyo Stock Exchange is the Tokyo Stock Price Index, otherwise known as TOPIX. As mentioned previously, the Nikkei Index ranks stocks by price and tracks the top 225 companies listed on the Tokyo Stock Exchange. In contrast, TOPIX ranks stocks by free-float adjusted market capitalization. TOPIX also tracks all domestic companies listed in the First Section of the Tokyo Stock Exchange. The First Section included 2032 companies as of October 2017. As can be observed, there are major differences between the Nikkei Index and TOPIX. It is often argued that TOPIX is a better representation of Japan’s stock market. This is because of the weighting differences between the two indices and the larger number of companies included in TOPIX. The Nikkei index does not allow individual foreign investors to buy and manage stocks directly. However, investors can obtain exposure to the index by buying stocks through exchange-traded funds whose components correlate to the Index. Exchange-traded Funds (ETF)Exchange Traded Fund (ETF)An Exchange Traded Fund (ETF) is a popular investment vehicle where portfolios can be more flexible and diversified across a broad range of all the available asset classes. Learn about various types of ETFs by reading this guide. comprise a selection of stocks or other securities. ETFs trade during the day and are prone to price fluctuations just like stocks. Investors use ETFs for speculative trading strategies like trading on margin and short-selling. Investors can trade the entire market as though they are trading a single stock. In creating a diversified portfolio, ETFs allow investors to meet specific asset allocation needs such as an allocation of 80% and 20% for stocks and bonds, respectively. Tax-aware investors can also take advantage of ETFs to reduce tax implications. The unique structure of ETFs allows investors trading large volumes of ETFs to redeem them for shares of stocks that the ETF track. The only USD denominated ETF that tracks the Nikkei 225 is the MAXIS Nikkei 225 ETF. The ETF was introduced in 2011, and it is the least complicated and most direct way for individual investors to invest in the Nikkei Index. MAXIS Nikkei 225 lists more than $80 million of assets under management. The MAXIS ETF trades on ARCA, which is the New York Stock Exchange’s (NYSE) electronic ETF trading platform. The MAXIS Nikkei 225’s price was 17.91 as at close of March 11, 2017. Apart from the USD denominated ETF, there are various ETFs that track the Nikkei and are traded on the Tokyo Stock Exchange. They include the Daiwa Asset Management ETF and the iShares Core Nikkei 225 ETF. Individual investors planning to invest in these ETFs must first go through a brokerage firm that offers international trading accounts. These accounts allow investors to trade assets that are not on American exchanges. Some of the reputable brokerage firms that allow international trading include E-Trade Financial Corporation and Fidelity Investments. When investing in Japanese ETFs, foreign investors are exposed to currency risk since these ETFs are listed in yen. Any exchange rate fluctuations between the dollar and the yen potentially subject investors to losses. For example, if USD appreciates relative to yen, an ETF that is not hedged will suffer exchange rate losses which reduces any gains made in the Tokyo Stock Exchange. There are several financial products based on the Nikkei 225 that are traded on stock exchanges around the world. These products include options, ETFs, futures, and warrants. The Nikkei 225 futures are now an internationally recognized futures index. Nikkei 225 futures were introduced in the Singapore Exchange in 1986, the Osaka Securities Exchange in 1988, and the Chicago Mercantile Exchange in 1990. The futures contracts allow investors to speculate whether the price of the underlying asset, the Nikkei 225 index, will rise or decline. Countries such as the United Kingdom, the United States, France, Switzerland, Italy, and Germany all have ETFs that track the Nikkei Index.